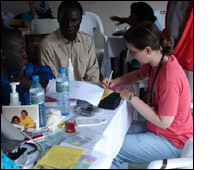 In August I joined a team of approximately 50 volunteers to Taraba State, Nigeria. Ten of us were from a program called Global Health Outreach, and the others were native Nigerians working with Pro Health International. After arriving in Abuja, Nigeria, we drove many hours past thatched hut villages and savannas until we arrived in Jalingo, a town in northeast Nigeria. Once in Jalingo, we worked rapidly to transform a vacant hospital without running water and equipment into a clinic, two operating rooms (one for general surgery and one for cataract removal), a post op ward, lab, pharmacy, an HIV testing/counseling center, and a dentist office. Everyday 300-400 tickets were given out to the people waiting at the hospital. All who received a ticket were able to see a physician, dentist, or optometrist/ophthalmologist during the day. However, even with this many, there were never enough tickets for all those waiting. Many even stayed overnight in hopes of obtaining a ticket the following day. The majority of the time I worked in the clinic area and acted as a consultant which is what Nigerians call a primary care doctor. Malaria, typhoid, hernias, large fibroids, goiters from iodine deficiency, back pain, lower abdominal pain - thought to be often due to chronic PID and chronic appendicitis, GERD, and HIV were all common problems I encountered. There were also a few extremely malnourished infants, a likely case of retinoblastoma in a child, fungal infections, and large baker's cyst. One child had corneal scarring from measles. A 5 year old boy named Gift had a severe cleft palate that extended up to the corner of his eye. He was named Gift because his mom dropped him off on his grandmother's doorstep shortly after birth. We did our best to try to arrange for an ENT to correct his face. Hopefully he was able to have this surgery after we left. The following week we traveled to Wukari, where we spent another week providing similar medical care. Here I was also able to go to a prison with a subset of the volunteers and provide medical care to the prisoners. We saw many fungal infections and lots of joint pain. One man had end stage HIV/AIDS and was unable to get all the prophylactic antibiotics that had been previously prescribed to him. We did our best to provide him with our limited supply. Overall, my time in Nigeria was very rewarding and life changing. I am still amazed that we were able to not only provide primary care but also general surgery, eye care, and basic dental care all at one time. Thank you for making this possible with through the Benjamin H Josephson Fund.